BALD HEAD ISLAND, N.C. - Golf carts glided by as our small group stood by the road listening to Maureen Dewire, our guide, play one of her favorite songs: the high-pitched call of the painted bunting. She aimed her iPod with attached speaker toward where she thought one of the brightly colored birds was perched. "Let's see if we can get his attention," she said. The bird answered back, and she spotted him high up on a newly leafing limb. "They're here all summer, but you don't see them because the males stop singing by late July," Dewire, 30, said of the painted buntings, which winter in South Florida, Cuba, and the Bahamas. The painted bunting's rainbow of colors - red chest, blue head, green back - make it arguably North America's most spectacular songbird. That's according to the National Audubon Society. Myself, I had never heard of them until the day before, when I arrived. Bald Head Island's maritime forest preserve has one of the country's largest populations of breeding buntings, so I decided I had to see one. For years I had ignored this car-free island on the southeast tip of North Carolina because I assumed it was all one big development with a golf course. I was partly right. At the bottom of Smith Island, measuring one mile wide and three miles long, there are some 1,060 homes and condos, and about 1,000 more to come, most being built by Bald Head Island Limited. But that's only part of the story. I discovered on a springtime visit that 10,000 of the island's 12,000 acres have been set aside for conservation. And what is being preserved is worth checking out. Our painted bunting sighting came after a two-hour hike filled with natural treasures. We were on the Creek Trail in the Bald Head Woods Coastal Reserve, where you can hear waves crashing on the beach in the distance. The nearly mile-long trail had been cut recently by volunteers and staff at the independent, nonprofit Bald Head Island Conservancy, where Dewire is senior naturalist. The conservancy runs programs year-round, has a gift shop and visitors center, and is raising money to build a barrier-island research facility. It also coordinates the nationally recognized Sea Turtle Protection Program, since the island is an important nesting site from May through October. On our walk, Dewire (a New Englander who grew up in Stonington, Conn.) pointed out 300-year-old live oak trees, a variety of laurel, and a massive felled trunk that a yellow-bellied sapsucker had turned into a cribbage board. On the walk back to our golf carts, before searching for the painted buntings, we spotted a red fox. Certainly a big contributor to conservation here is the absence of cars. The inn we stayed at provides guests with golf carts, as much of the lodging here does, but most of the time we used bicycles we had rented at an island shop. Except for the occasional maintenance and public safety vehicles and the more-frequent "beep, beep, beep" of reversing golf carts, the island is blessedly free of traffic sounds. Bicycles and golf carts share the 26 miles of narrow roads, which can get a bit crowded in summer. The year-round population of 220 can swell to 4,000 to 6,000 at high season, including boatloads of day-trippers. 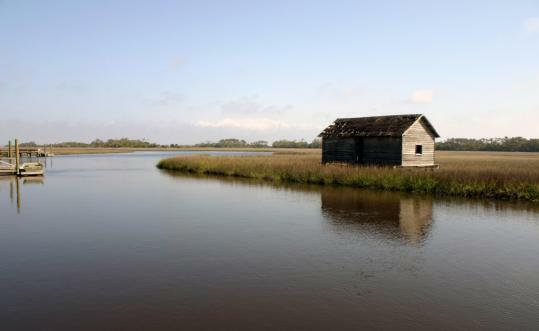 The 25-minute ferry ride from the middle-class coastal town of Southport offers a first glimpse of the people who frequent Bald Head Island. Dressed-down folks carrying cameras and daypacks share bench space with those attired in pressed Polo button-downs, some with Louis Vuitton handbags. Bald Head's main harbor and village area resembles Nantucket - if Nantucket had been built starting in 1983. That's when the most recent and only successful owners, the George P. Mitchell family, stepped in to form Bald Head Island Limited. Although the developer clearly respects the natural surroundings, a rarefied air hangs over the clusters of multimillion-dollar homes. While houses are closely ringed by trees and thick flora, they also look just homogeneous enough to be a touch Orwellian, all the way down to the little blue signposts announcing a house or lot is for sale. "It's a little too precious for me," said John Spear of Spruce Head Island, Maine, a day-tripper who was vacationing in the area. "It's too manicured." Other visitors are nuts about the place. "My parents have been coming here for years," said Roberta Fenska of New Jersey, who was on our hiking tour. "I say, don't you want to go someplace different next year, and they say, 'No, there's no place like Bald Head.' "
One place not to be missed is Old Baldy, or the Bald Head Island Lighthouse. The oldest lighthouse in the state, Baldy was built in 1817 and, though its light was extinguished in 1935, still draws a stream of visitors. Every other golf cart, it seems, sports an "I Love Old Baldy" bumper sticker. The brick and cement on the 110-foot octagonal tower is so worn it looks like camouflage - a patchy pattern that is repeated on gift shop magnets, needlepoint renderings, and illustrations. For $3, visitors can climb the 108 steps to the top. From there you can see miles of mostly pristine beaches and an incredible amount of green space, as well as remnants of 1.7 miles of earthen fortifications from Civil War days. Even earlier, in the 1700s, Blackbeard and other pirates terrorized this coast, and before that, Native Americans lived on the island and the mainland. Of course the water is as much a lure as the land. If you want to arrive by boat, the Bald Head Island Marina and Yacht Club has space for 155 vessels. On the ocean sides, despite the island's air of exclusivity, more than 40 public access points direct visitors to the surf. The most fascinating spot, although I wouldn't want to wade in, is Frying Pan Shoals, a mess of choppy waves starting just offshore. The 20 miles of sandbars was responsible for hundreds of shipwrecks in the 19th and early 20th centuries. The island is dog-friendly, and even the beaches welcome canines. Waste disposal is encouraged by placing bag dispensers at every access point. We met perhaps the island's most famous canine resident, Captain Jack, a 9-year-old Great Dane owned by Bill Waddell, who has called Bald Island home for 11 years. Weighing in at 195 pounds, Jack spills out of the front passenger seat of Waddell's golf cart, where he sits as regally as possible. "One lady saw us and said, 'This is the place for me,' and she bought a lot," said Waddell, adding that Jack also has graced the cover of a real estate agent's brochure. As for life of the wilder variety, while much of it sticks to the woods and the salt marsh, the population at the Bald Head Island Club golf course underscores the islanders' coexistence with nature. "There's a flock of white ibis that hangs out on hole No. 7, on the sandbar," Dewire said. "Hole 7 and 13 have osprey nests. We've had really high winds lately and one of the osprey nests blew off, but people rebuilt it. A monster gator lives in the lagoon on hole 16, and there's even a red fox that steals golf balls." The closest airports are Wilmington International Airport, Myrtle Beach Airport, but Raleigh-Durham International Airport typically has the lowest-priced flights from the Northeast. Bald Head Island can be reached by ferry (25 minutes), departing on the hour from Indigo Plantation Ferry Terminal, 6099 Indigo Plantation Drive, Southport. 910-457-5003. Round-trip adult tickets $15, children ages 3-12 $8. Ferry parking $5-$7 a day. Programs include birding, hiking, kayaking, and sea-turtle protection. Adults $3, children 3 and under free. Historic Tour Package includes ferry ride, guided tour of sights, admission to lighthouse and restaurant coupon; adults $45; children 12 and under $40. Surfing lessons, tours by bicycle, golf cart, and kayak available. $140 for a round of golf with temporary membership (available with many rentals). Developer Bald Head Island runs a vacation-rental service for rental condominiums and houses around the island. An average two-bedroom is $2,800 a week. Doubles $190-$275. Nantucket-style building overlooks the harbor. Casual spot with plenty of outdoor dining. Lunch $6-$13, dinner $11-$22, steamed shellfish pots $13-$20. Casual restaurant specializes in regional dishes such as crab cakes ($25) and fried green tomatoes ($8). Dinner appetizers $8-$12; entrees $15-$29.